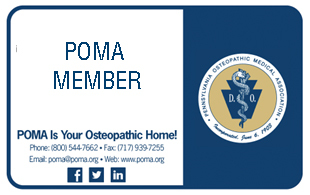 The Pennsylvania Osteopathic Medical Association (POMA) proudly represents its professional osteopathic family since 1903. Our family includes more than 8,400 osteopathic physicians, residents & interns and 2,590 osteopathic students. Through the promotion of public health and encouraging scientific research we aim to continue to advance the science and art of osteopathic medicine. As the osteopathic medical field continues to grow, we remain your home for everything osteopathic medicine. POMA 111th Annual Clinical Assembly & Scientific Seminar NEWS! Introducing Your Keynote Speaker, Kim Becking! The Keynote Address begins at 10:45 am on Wednesday! Whether you are a veteran DO, a resident or a student of osteopathic medicine, POMA works to supply you with the information and connections you need. We are your legislative voice across the state, your advocate for the osteopathic profession, your source for state licensure information and CME credits - we are here to assist and provide everything you need throughout your career as an osteopathic physician in Pennsylvania. Join today and start receiving all the benefits of a POMA Membership! Looking to become more involved with POMA? We encourage all of our members to contact their District Leaders to find out more about how they can make a difference on their local level. To better provide representation, POMA is divided into 13 districts who regularly meet to discuss issues and news going on within the osteopathic field and within their communities, as well as to offer networking and social opportunities. Click below to find your district and information about their next meeting.